Stephane Girard was the first non-American president of the Wharton School of Business Wine Club. He’s come a long leap across “the pond” from when he organized tastings for that 700-member club to opening up his first, and a first- of-its-kind, Wine Bar, Wine Shop and Tasting Room in Paris, just off the Place Vendôme. This all-in-one -on-tap -bar and shop is called Wine by One. 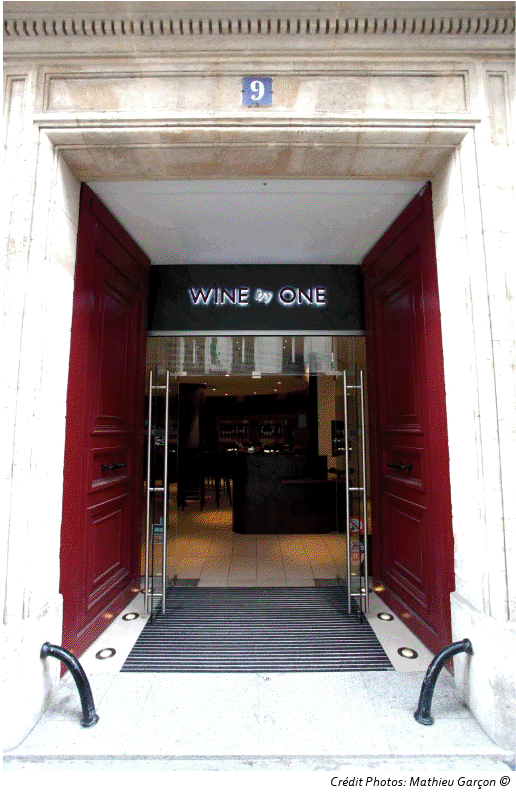 Wine by One, Paris, 75001. Photo courtesy Mathieu Garcon. 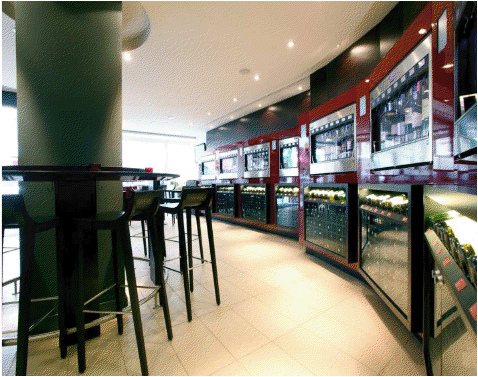 “We offer a 100 different kind of wines by the glass. We are the only wine bar in the world to have so many different wines on offer at any given time,” explained Girard at a recent wine tasting. The key to his success – and the wine bar, if measured by the number of people sipping wine and nibbling on appetizers on any given evening, is certainly already a success! – is the wine pouring/preservation machine that he uses to automate the pouring of the wine tastings. Girard, a Frenchman, refers to his machine as caves á vins, which houses 8 bottles of wine each and keeps each wine at its ideal temperature and conditions of service and preservation. He didn’t invent this machine. In fact he saw it used by an entrepreneurial sommelier when he was still back in the States getting his MBA. 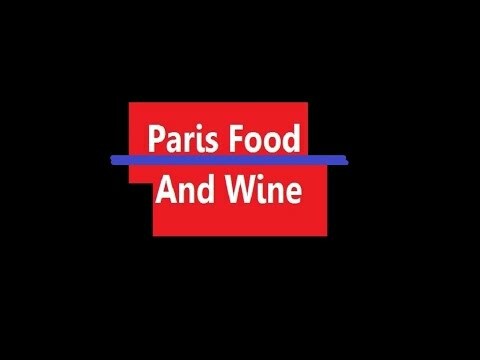 What he did pioneer for Paris is the business model that allows him to offer wines to people in ways that are accessible, affordable and appealing. 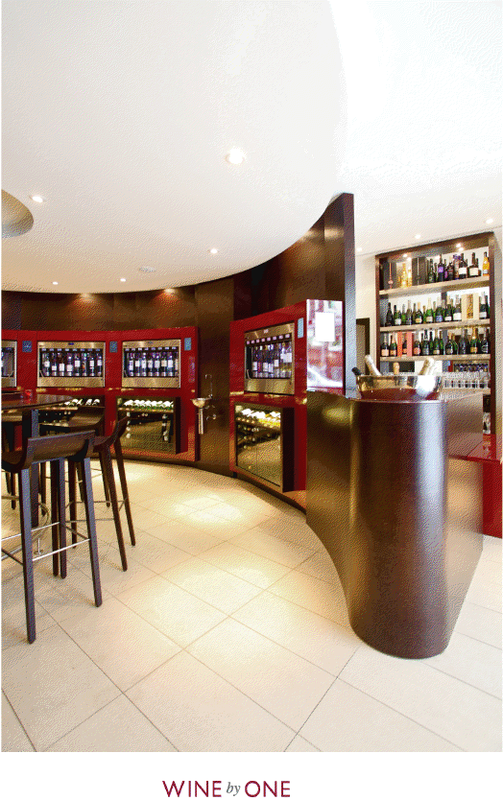 Wine By One, wine shop and tasting bar. Paris, 75001. Photo by Mathieu Garcon. The wines are set up in their groups of eight in their respective caves á vins for pouring a Tasting (Impression, 3cl), a Tentation (half a glass, 6cl) and a Sensation (a whole glass, 12 cl). What’s great about this is that you can commit to the wine a little or a lot, depending on how much you like it. It’s also a great playground for training your wine palate where you have 100 different bottles from all the world’s regions on hand. They add 5-10 new wines each month, on a rotation method. The machines are set up as self-serve as well, so you almost have the feeling of it being a 7-11 set up – for top-notch wine! Wine by One promotes itself as being a very affordable way to try new wines and also great wines. This is true, for the most part. Some of the wine tastings do start at about 2 Euro or even a little less. But it’s altogether too easy to want to try the 5 and 6 Euro tastings. Also, the tastings give you slightly more than one sip. So you are more likely to go for the half glass which is easily in the 4 to 8 Euro range for some of the names that you’ve only ever read about. And, of course, when I saw that Wine By One had Les Sorcières du Clos des Fées d’Hervé Bizeul…on tap!…well, of course I had to go for the glass, (11 Euros). The long and the short of it, then, is that, yes, you can do tastings for a few Euros but likely you will be tempted by other wines. Expect to spend at least 25 to 30 Euro per head, and that’s not even including any food or bottles of wine purchased to take home with you. Two of the additionally seductive factors of Wine by One are that you can order food and you can buy the bottle you just tasted to take with you and enjoy for later. 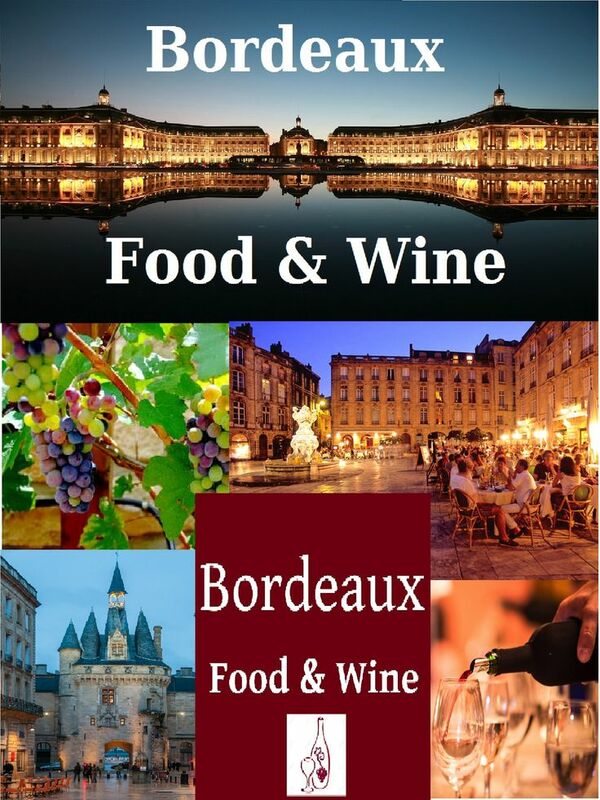 Not many wine shops in Paris have the permitting required to be able to sell food. Girard has a unique position for his wine shop, then, in that people can order small bites and nibbles as they’re tasting. You can also stop in midday for lunch which is the French style sandwich, tartine, toasted and with a generous amount of gourmet spread, then finished off with a specialty coffee and all for about 10 Euro. The leather lounge seats by the window, and the rue des Capucines location just off of Place Vendôme make it a great choice, and one that is slightly updated from the regular Bistro, while still being very French. Just off the Place Vendome, Wine by One is open for lunch, too. Photo courtesy Mathieu Garcon. Another appealing characteristic of the Wine by One biz model is that Girard has engineered a way to make Wine by One feel like a club. When you arrive, you must sign up for a card that you use to purchase your wine and tastings. Think along the lines of a Kinko’s card. Except that here, they ask you for 2 Euro before they give you the card and you have the option of it being personalized with your name. More good things: There’s a Water Bar or Bar á Eaux which offers a dozen different kinds of water from all over the world. And they offer complimentary WiFi. The wines here are just average and overpriced for tastings. The staff does speak English but are not very helpful…poor customer service and not knowledgeable about the wines. Food is decent for a small charcuterie and cheese plate. Expect to spend about 40-50 euro for 2 people to taste a few very average wines (equivalent to perhaps 1-1.5 glasses of wine per person) and cheese plate. For this cost, you’re better off enjoying a nice dinner. Wouldn’t go back.